Build Platonic Solids by copying these patterns or use the links below for more help. Click here for a printer-ready .pdf file. 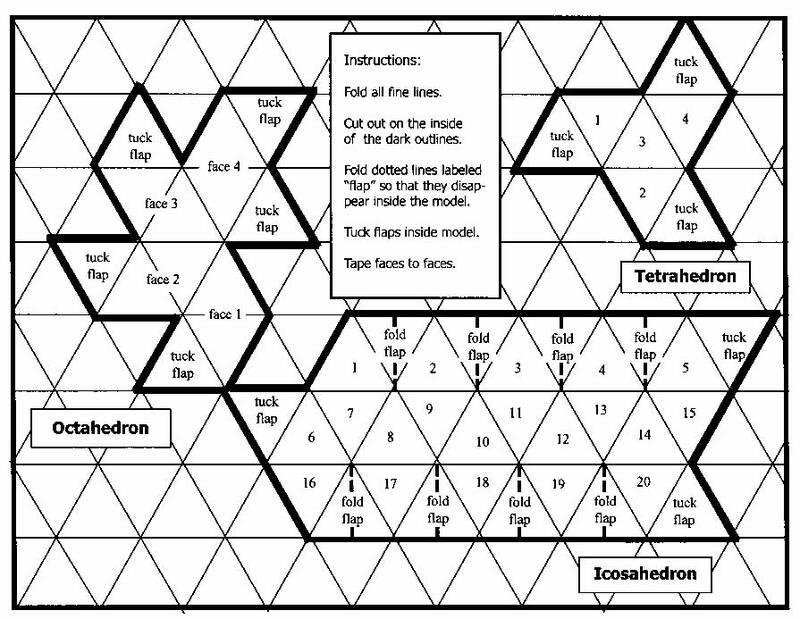 Sacred Geometry shows how to construct the Platonic Solids, Archimedean Solids and the "flower of life" which contains templates for the Platonic solid series. There's also printable Platonic Solid models and a link to Mr. Rawlin's book on the subject. Geometry from the Land of the Incas a labor of love by Antonio Guttierez in Peru who features some of the megalithic monuments in his solutions and as puzzles. A must see site! Triangle Tiler and Tetrahedron puzzles at the University of Minnesota's Geometry Center. Rotate Platonic Solids and Achimedean Solids or play with the Kali geometry program to create dazzling tesselations. Rotate or move an icosahedron or other Platonic Solids with this Java applet. Alex Bateman's Origami page has Postscript patterns ready for printing and folding. Fibonacci Numbers and Nature shows how rabbits reproduce and pine cones and palm trees spiral. Explore phi -- the "golden mean." Polyhedra Pastimes is a great links page about Polyhedra and Tesselations giving a brief synopsis as well as ordered links groups divided into 30 activities. Paper models of polyhedra on this fantastic site. Gothic Geometry site pushes their book, but has four sample pages. Jim Loy's fabulous mathematics pages written by someone who uses hands-on as well as formulae to explain everything usually forgotten since high school. University of British Columbia Mathematics Department JavaApplets. Click here to solve Pythagoras Theorum and Kepler's Laws, or use their function plotter and solution finder to solve problems. How to draw Celtic knots and other mazes. VassarStats. Free statistics, simulations and demonstrations of statistical principles, possible misinterpretations and more in this Vassar faculty member's 17-chapter Web textbook. Be there or "chi square." Currency converter and cross rates for world currencies. Just in case you ever need to covert zlotys to yen. Math Forum. This year's theme is "Math Spans All Dimensions." Visit for an interesting site about all sorts of mathematics, aimed at a visual audience. Fractals and links to more fractals. Chaos Hypertextbook covers iterated maps, strange attractors, fractals with illustrations and links. The Random Organization provides random numbers from atmospheric fluctuations, while another gets them from Geiger counter clicks on krypton-85 decay. Math Gate -- annotated links to dozens of sites worldwide.